Yourself on the Web: If Your Don’t Market Yourself on the Web, Then Who Will? Who should be the Pirate of the Caribbean? Linus Torvalds? Johny Depp? Russell Crowe? James Governor: would you like to join us for a RedMonk Radio podcast about Linux and STG? Good news, bad news. Winston Churchill, Richard Nixon. Where did copyrights and patents come from? On child’s play on the Internet: Tag, you’re it! Don’t hide, so others can seek. Which side of the firewall are you on? If you are on the inside then you are on the wrong side. Thanks Steve O’Grady. Thanks Redmonk. On blog posting: DUD? RERO? or BLOAT? Announcing Open-source Java: What if? Noam Chomsky to Thomas L. Friedman: Bring in the Green Cat? How? Colorlessly! Sleepily! Open-source has grown up. Shouldn’t we? We license your departure — If Nancy departed early, what gave here that license? What were the conclusions that Nancy drew? The TWIT license: Departure from the norm? What norm? Whose norm? Why blog? If you don’t, who will? Say it ain’t so, Sam. Serve your time, then do the crime. What’s in a name? Gnubuntu or Ubuntu? My blog is being categorized. Is yours? It’s Pirate’s Day, Matey. Don’t be fooled by it, as was I. On Being a Celebrity: Till Death Do We Part? Using Technorati to see what people are saying about your blog, and more. Why Ubuntu? 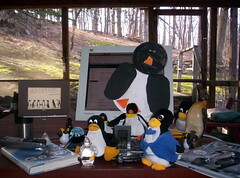 The NY Times Picked It To Represent Linux, And Said Good Things About It. Having a bash bashing Microsoft, continued. Is This An Unusual Musical Skill? Query To Bloggers: What Is Your Best Post? Your Best Passage? What Are Your Favorite Web Sites or Blogs? Any Wild Python Programmers Out There? Thomas Friedman: Did We Do That? Can you explain open-source in one sentence? Ubuntu 7.10: Inflection Point or Tipping Point? The Sun / Red Hat Java announcement: 2002 or 2007? k12openminds07: I just ordered my XO Laptop. Have You? Shall I tell them it is only a week until Thanksgiving? xo-laptop: “ok, ok, I bought one.” My XO Ranking is now 8. Message from The Tuxers: Think, Dave! Don’t Use Windows! xo-laptop: My XO Rank is now 12. What is yours? xo-laptop: Mike Todd gets it. Will you? Am I about to become a source of authoritative opinions on Ecclesiastes 5:13 ? I just ordered a hat. Why? What kind? What color? If there were a Nobel Prize in braggadocio, who would win it? Do You Have To Prove It Works? On the Apple Imac: It’s a Unix system. I know this! XO-Python: Where Are the Software Engineers of Tomorrow? Is there a computer program to solve Kenken puzzles in Python for Ubuntu Linux? Jack Schwartz: Over the course of a career you can hope for at most a handful of opportunities, and perhaps only one, to be present at the creation of a project that will have real impact. Tips from daveshields: If you have a valuable asset, then you need an expert to manage it for you. If you think you haven’t hired an expert, then you already have — you. If you don’t think you are qualified, then fire yourself and hire someone better.